Have you always been fascinated with Japanese maples but thought you did not have the room, or that they were too difficult to grow? 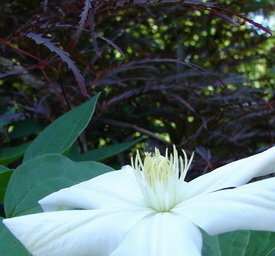 There are many varieties available to suit just about every garden size and style. See how you can add these graceful beauties to your landscape. 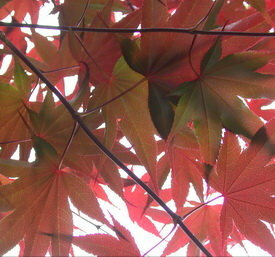 When I look at Japanese maples, I see living masterpieces of art. It is as if they represent the pinnacle of tree evolution. All the other trees must be quietly jealous. I was fortunate to inherit a large specimen when I bought my house - it is the focal point of my front garden. Like adding side stones to a precious diamond ring, I have been adorning my garden with smaller varieties over the past seven or so years. 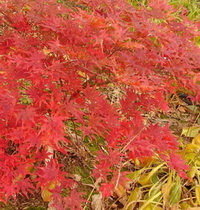 For a good overview of Japanese maples, see Todd Boland's article. 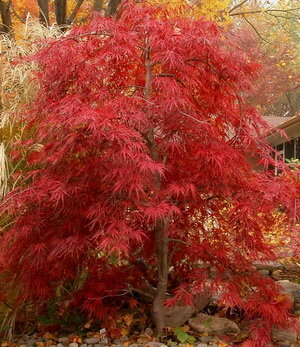 Smaller Japanese maples allow the gardener the option to use this tree in many of the same areas that would be used for shrubs, or even perennials. They can be used as a stand-alone specimen, focal point or part of a mixed border or woodland setting. As with the larger ones, there are sun tolerant varieties, though most prefer part shade and relief from the harsh midday sun. Similarly, other cultural considerations are the same for all sizes. The soil must be well drained and protection from strong winds is advisable. When choosing varieties, consider size, shape - upright vs. weeping, summer color - red/purple vs. green, and leaf type, which ranges from the deeply 'cut' dissectums or 'lace-leafs', to the wide palmatums, which resemble 'typical' maple leaves. Shape and size of the weepers depend in large part on the height of the graft. 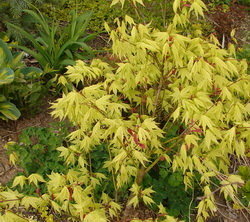 Most Japanese maples have the wood of the particular cultivar (scion) grafted to the hardy rootstock - Acer palmatum. The height of this graft can be anywhere from inches above soil level to around 30 inches high. Sara Monte, of Wildwood Farm (Watchdog) in Kenwood, California, says there are a number of reasons for choosing either a 'high' or 'low' graft when selecting a dissectum. "A high graft will create a showy tree a bit sooner, and is necessary when using cultivars with long branches, such as 'Octopus'. It will also give 'instant height' when the maple is sited near lower plantings." Monte, who runs the maple nursery with her husband Ricardo and son Joe, says low grafts are suited for situations where the gardener wants an immediate 'drape effect'. This can be in terrace or rock gardens, or even in containers. Another important distinction, Monte adds, is that "whether in the ground or in containers, a lower graft will allow the trunk to develop with bends and twists, giving a more individual and dramatic look." I have used the smaller varieties in mixed beds, combining them with plants with contrasting leaf shapes and complementary colors. 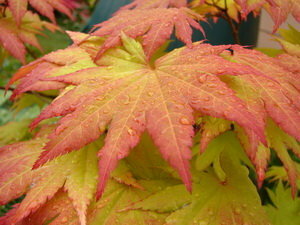 I consider the color of the maple in each of the three growing seasons when deciding where to plant it. Many have a distinct look in each season, so I will try to find a spot where the combination will work in all three. 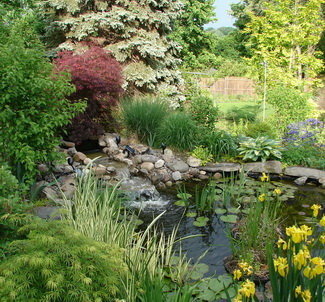 For example, above the waterfall of my pond I have 'Tamukeyama'. It is a dissectum that both grows upward and cascades (picture a tall 'Cousin It', or look at the top photo!) Near it I have 'Karl Foerster' grass, a Viburnum dentatum 'Blue Muffin', a Heptacodium miconioides, and in the background is a large blue spruce. About five feet away is a dwarf Colorado spruce and a Fothergilla 'Mt. Airy'. The spruces provide a wonderful color contrast all season long. The viburnum and heptacodium provide foliage contrast and a steady green against the varying shades of red/purple/green of the maple. The grass provides a foil by standing straight up next to the weeping maple. The movement in the slightest breeze adds to the movement of the water. Finally, when the maple turns a brilliant scarlet in fall, the color is echoed by the red/orange tones of the fothergilla and contrasted with the viburnum, which fades to yellow. If I am lucky, there are still some red calyxes left on the heptacodium as well. 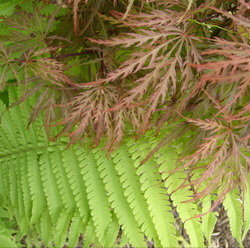 Fern color echoed in 'Inaba shidare' veins. I recently limbed up my large red Japanese maple and underplanted it this past fall with six smaller varieties. I tried to pick ones that will complement each other throughout the seasons. They are 'Corallinum', 'Aratama', 'Green Mist', 'Skeeter's Broom', 'Shidava Gold' and 'Octopus'. Hopefully they will provide a soothing mixture of form, texture, color and habit from spring through fall and will be the little diamonds surrounding my large gem. 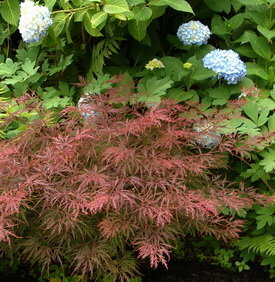 Smaller Japanese maples pair very well with dwarf conifers as well. Silver, gold or light blue-needled conifers set off the reds or dark greens nicely. The more palmate leaved varieties will provide a better contrast in texture with finer needled conifers. 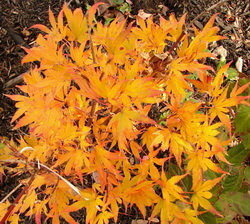 Japanese maples put on their best displays in spring and fall. In effect, the entire tree becomes one large bloom. With that in mind, choose your location and what plants you want nearby. Try to avoid locating them near plants that will distract from their show. For example, don't put a maple that has pinkish spring tones next to a pink flowering shrub that blooms around the same time the maple foliage emerges. Remember that with these beauties, the foliage is the flower. 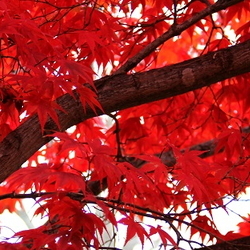 The maple color can vary from year to year. 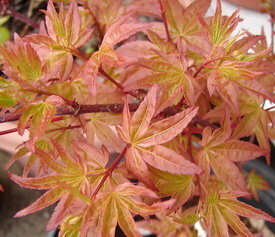 In more overcast summers, my 'Tamukeyama', which is in full sun, will retain more of its deep red coloration. More sun results in more green. 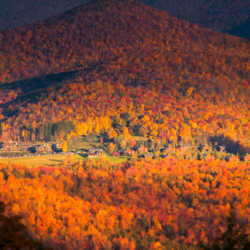 Fall color is also dependent on a number of weather related factors. This past year was one of the most spectacular in memory for maples, and Japanese maples in particular, in my area of New York. I hope you will consider gracing your garden with these elegant, petite trees. They will add a quality of timeless beauty. Photos: All photos by the author in his garden. Top photo is 'Tamukeyama' in June. 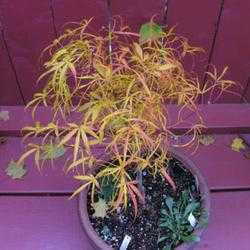 See more Japanese maple photos in PlantFiles. Special thanks to Sara Monte, of Wildwood Farm. My background is in engineering, but these days I am a stay at home dad. I have always loved Nature, but had no idea when I bought my house that I would become the gardening fanatic that I have. Gardening both stimulates and relaxes me, appeals to all my senses and gives me the privilege to be part of the Nature I love.